Guy Breton is part of the Beaujolais “gang” of traditionalist growers and winemakers seeking to craft pure and organic wines that convey the unique terroir in Beaujolais. Breton’s domaine is a tiny three hectares; a percent of which lies in the appellation of Morgon. The vines range in age from 8 to 80 years. The naturally low pH of the soil in which the vines grow makes for favourable conditions to practice sulfur free vinification. Guy Breton vineyards are farmed organically. Vinification begins with indigenous yeasts and carbonic maceration and lasts 15 days, then malolactic fermentation takes place in barrel and rests for 6-8 months. The wines age on the fine lees in third use Burgundian barrels. The wine is bottled unfiltered and unfined. 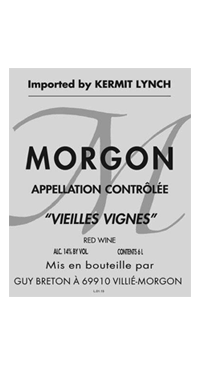 Morgon Vielles Vignes is Guy Breton’s principle wine. The grapes are sourced from a high-lying sandy parcel that contributes to complexity, structure, and acidity to the wine.